Techniques for diving in the deeper range of 18-40 meters / 60-130 feet. Experience in planning, organising and making deep dives under the supervision of your PADI Instructor. Be certified as a PADI Adventure Diver, Junior Adventure Diver or have a qualifying certification from another training organisation. 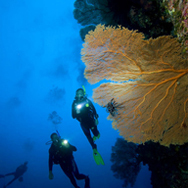 The course consists of four dives. If you have done the deep dive as part of the Adventures in Diving program that dive may count as the first dive of this course.